A rare West Coast appearance! A founding member of the legendary British improvisation collective AMM, Keith Rowe’s profound, ongoing reappraisal of the electric guitar’s potential has redefined the idea of instrumental virtuosity by virtue of the extraordinary sounds he draws from the instrument and the minutely varying degrees of control he exercises. An originator of the table-top guitar, he prepares the strings with all manner of objects, going beyond “free jazz” to reinvent the guitar as a tonal source of electro-acoustic sound and noise. The result is raw, thrilling, and unpredictable. 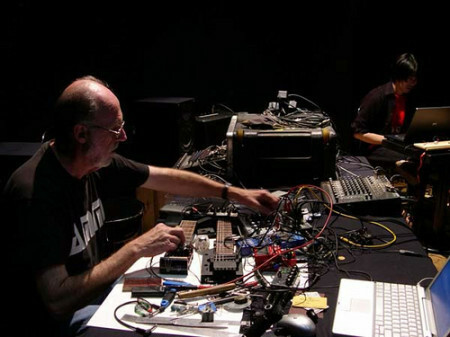 Active since the 60s, Rowe, like his compatriot Derek Bailey, has since influenced several generations of avant guitarists, from Syd Barrett to Fred Frith to Jim O’Rourke and countless others. In recent years he has made it a point to work with younger players, including Japanese noise artists, German laptoppers, and Northwest expat saxophonist Jeffrey Morgan. This is a rare opportunity to hear him west of the Mississippi.